← Corvair College #29, March 28-30, Leesburg FL. Woody’s 2,850cc Corvair/601XL hits 400 hours. I spoke to our “Man on the west coast” 601XL builder and pilot Woody Harris last night. I caught him on his cell phone after he had just landed at Merced CA. He was short of his home destination, Vacaville in Northern California. He and a friend were shut out from returning by weather. No matter, Woody’s daughter lives near by, and they were having a beer in the pub while they were waiting. Woody is the kind of guy who is flexible enough to have a good time in any situation, even if it was unexpected. His friend had driven in it, spending 14 hours the day before behind the wheel. In the middle of the 10 minute call, Woody mentioned that he had just crossed over 400 hours in his plane, (N743WH). To people who do not know homebuilts this sounds modest, but it isn’t. For a variety of reasons, less than half of homebuilts reach the 500 hour mark. But it isn’t the hours I find impressive, it is the fact that Woody has flown his plane all over the country and had some incredibly good adventures. What should be important to you is that his plane and 2,850cc Corvair engine are straight out of our parts catalog and installation manual. In the links below, I relate that Woody is not a life long aviator. He has been in the game just a few years. In short, there is no reason why anyone reading this couldn’t achieve what he has done. Woody took our proven path and used it to serve him. While it did take time and cost money, neither of these are the major hurdle to others doing the same adventure. The single biggest impediment is just deciding that it is your time to get started on this adventure. I can show you how to build the engine and install it, I can put you on our ‘Zenvair builder list”, I can have you at a college, offer all kinds of support. But the one thing I can not do for you is to make you get started. That decision must come first. I was going to say that you must have faith in your own ability to learn the skills you will pick up in the building and learning to fly process, but faith is the wrong word. Technically, faith is belief in the absence of evidence. Deciding that 2014 will be your year does not require faith, just observation. Your belief that you can do this can simply be based on observing that Woody, and dozens of other Corvair builders have done it. Some of them might have predeveloped skills or a bigger budget than you, but that just changes the time line a bit, the opportunity for adventure is just as open to you. You just need to decide that you will do this. Above, Woody’s plane on the way to Oshkosh 2011. For starters, I am going to confess to stealing most of these pictures off well-known Zenith 601 builder, Steve Smith’s website. My only defense is that I always ask our guys with flying planes to send in pictures, but a lot of them are too busy having fun. Woody is part of the group of guys that move from one adventure to another without documenting many of them. Steve is a California based 601XL builder with a Jab 3300 on the front of his plane. He, Woody and Zenith’s west cost guy Doug Dougger (who has an O-200 in his bird) fly around together on a lot of trips, including a big one to Oshkosh that provided some of these photos. Woody flying over Grand Teton. Woody and Doug Dougger over South Dakota. Woody needs little excuse to fly places; Above he is speaking with Sebastien Heintz, president of Zenith Aircraft, at a West Coast Zenith fly in at Quality Sport Planes in Santa Rosa. This facility was the site of Corvair College #11. From Steve Smiths Website: “Left to right: Woody’s Corvair powered Zodiac XL, Doug Dugger’s Jabiru powered 750, Steve Smith’s Jabiru Powered Zodiac XL. The Chicken Strip is a dirt/gravel landing strip in the Saline Valley of Death Valley National Park. Lat/long is 36.807,-117.782. Above Woody’s plane among friends in the Zenith booth at the Golden West fly in. In the above photo, Woody Harris’ 2,850cc Zenith 601B sits at the end of the ramp in North Carolina at First Flight Airport with the Wright Brothers Monument in the background. Christening Woody, above left, and his friend Steve celebrate with cigars and Piper Heidsieck champagne after the first flight. 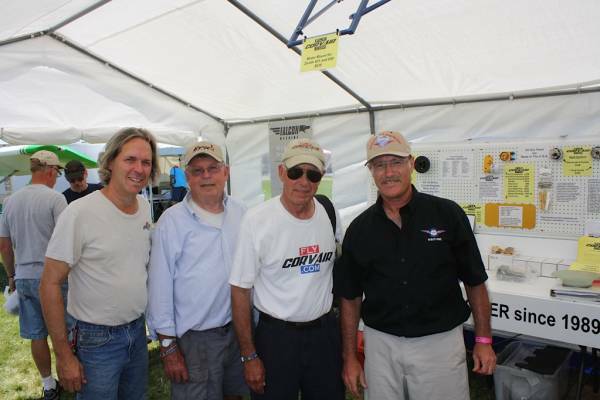 In our booth at Oshkosh 2011, I stand with three pilots who flew in their Corvair powered Zeniths. From left to right, Shane McDaniels who flew in a 2,700cc CH 650 from Missouri, Woody Harris in a 2,850cc CH 601B from California, and Andy Elliott in a 3,100cc CH 601B from Arizona. If you would like to be in a future version of this photo, you must willfully decide to advance your dreams. I was looking for something else on the internet and came across a discussion group called something like “Homebuilt Planes” and a sub group called “aircraft design”. It had pages of commentary on Corvair engines. The group had only two people with the message ‘apearently they work,’ but these voices were drowned out by a chorus of people, all with pathetic mystery email names like “RV6guy” comparing alleged engineering analysis of the viability of fly a Corvair, and all citing their ‘race car’ backgrounds. Their Conclusion: It can’t be done. They gave long dissertations about how small the main bearings are (Reality: Corvair’s have much bigger mains than an O-200) That 5th bearings will not work, (there are more than 100 flying including Woody’s) you would need a reduction unit (99% of Corvairs have never had one) and props above 2,500 have no efficiency ( Lycomings are certified at 2700 to 2800 rpm, they didn’t add that last 300 rpm to make less thrust). How do I say this diplomatically? Those people are losers, and they are the exact type of critics that T.R. found contemptible. If you believe the analysis of anonymous sources over facts and real people with names and planes like woody, then you are letting people you never met decide your fate, rob you of your adventure, and make you into their kind of loser. I can not explain how little I think of people who don’t have the courage to even use their name when publicly criticizing the efforts of actual people. I just wrote the story Four Men, about aviators I met who fought in WWII. On the scale of courage that these men understood, using your own name on the internet when criticizing others requires about .0001% of what they delivered every day. For the 25 years I have been building homebuilts, there has always been people like that. Years ago, their effect was limited to earshot as they would criticize the workmanship on planes at the flight line. Back then, I often took a moment to say in front of everyone “You sound like an expert! Please, lead me to your aircraft so we can all see it.” which of course, they didn’t have, because just like todays internet people, they were critics, not builders in the Arena. These people will never go away. The vital thing to do is make sure they don’t steal your dreams. Zenith 601XL Builder Woody Harris at Copper state flyin. 3 Responses to Woody’s 2,850cc Corvair/601XL hits 400 hours. Congrats to Woody! The number of hours on his engine and the long trips are impressive. He must have a great deal of confidence in the engine, given the places he has flown. I flew 2.5 hours yesterday over some very inhospitable frozen wilderness. Seeing guys like Woody racking up the hours is a definite confidence builder for me. More compliments to Woody on hitting 400 hours. When he spoke at the Copperstate Fly-in a few years ago, he was a great representative for Corvair motors in airplanes. He admitted his mistakes, and used them as a teaching moment to help everyone to do better.